Strike Ball 3 Game Review - Download and Play Free Version! Bust Bricks and Take Cover in the 3D Breakout-style game Strike Ball 3! Power-ups to increase your smashing capabilities. Physics system lets everything in the environment react to actions. Can become tedious to try and clear levels entirely. Lots of levels but not much variety. Adding onto the series, Strike Ball 3 continues the fantastic Breakout-style gameplay of its predecessors and adds in some spectacular new game elements. With a variety of power-ups and level designs which are built specifically around items, Strike Ball 3 presents an interesting 3-D experience. The biggest addition to the series is the PhysX engine, powered by nVidia, which means that when you knock a box over, the game will calculate exactly how it should tumble, roll, or ricochet off other objects. What you get is some rather intense physical interactions as bricks are falling all around with your balls ricocheting through this chaotic scene. Another big difference in Strike Ball 3 is the importance items and power-ups take in the gameplay. 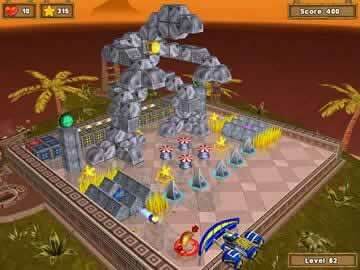 For instance, metal bricks can't be destroyed by standard balls, but there is a machine which throws out homing missile power-ups which you'll need to collect to shatter those metal blocks, allowing your ball to take care of business. Also, the power-ups are upgradeable in between stages by spending collectible stars which can be found within the levels. Strike Ball 3 refines the classic Breakout gameplay elements which the franchise has become known for. It's complex level designs and item system will require you to plan ahead a bit and employ some strategy in order to complete several levels, especially later on. If you like brick-busting games and simple, riveting gameplay, then download Strike Ball 3 today! In Strike Ball 3 you smash your way through level after level of enemies and landscapes. Through the levels you will experience 3D Breakout style action like never before. Along the way you encounter a large number of maps full of interesting characters and elaborate setups for you to smash. Giant robots made of tires, windmills and much more need to be destroyed on your way. 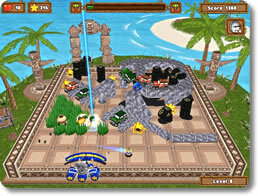 The gameplay is similar to other Breakout style games. You have a bat at the bottom of the screen, that is controlled by your mouse, and a ball that bounces around the screen destroying the various objects on the map. It is your goal to prevent the ball from going past the bottom of the screen. You act as a sort of goalie. As you smash various items, items come out of them and slowly approach the bottom of the screen. These items can be different things: power-ups, extra points, extra lives, and even power-downs. Collecting power-ups enhances your ability to clear levels. You can receive items like a wider bat or weapons like a missile launcher. There are tons of different power-ups to get that help you along the way, but watch out for the bad power-ups because they make your life harder. To pass each level you will have to destroy a certain amount of the level and collect an item that will advance you to the next level. This game has a large variety of objects to break. There also objects with special properties, such as pyramids that repel your ball or blocks that can only be be broken by destroying a certain block. These special blocks add some challenge and skill to the game since you must carefully aim your ball to hit them. 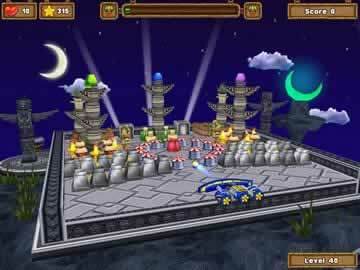 You can also collect stars (there are five stars on every level). The stars can be used to upgrade the effectiveness of the power-ups you collect in each level. The power-ups will not become permanent but they will last longer or offer more ammo. One unique aspect of Strike Ball 3 is the physics engine that controls the environments. All the items interact appropriately. When you knock over a box it will fall down and knock over other things along the way. This makes for some pretty spectacular crashes as you smash through the levels. The graphics in the game are great. All the levels are well detailed and in full 3D appearance. All the giant robots made of tires an other various objects add a humorous effect to the game. In one level you even have to knock over a windmill. The sound is another great quality of the game. Lots of explosions and lumbering robots are all well done. The sound and graphics really help make this a great game. This game really only lacks in a few areas. There is not a lot of variety in the levels. They are laid out differently but contain a lot of the same thing. Another issue is with clearing the levels. If you happen to miss the token that advances you to the next level you have to clear all the items from the screen to advance. This can be very challenging to accurately control the ball. You might find yourself spending ten minutes trying to break one box. With a large number of levels to complete, you won't soon run out of things to do. Easy controls and a humorous environment make this game playable by anyone. The whole family will love playing Strike Ball 3. Giant robots await you in this great Breakout style game. Watch some intense scenes from this exciting breakout-style game. Get a quick glance at some of the power-ups you can collect such as the air strike, machine gun, or multi-ball.